PJSC “Energomashspetsstal” was nominated in the award of the most open and transparent institutions of Kramatorsk. The public control center “Kramatorsk act” was the organizer of the contest. The award ceremony took place on the 10th of June in the hall of the Anti-Crisis Media Center. 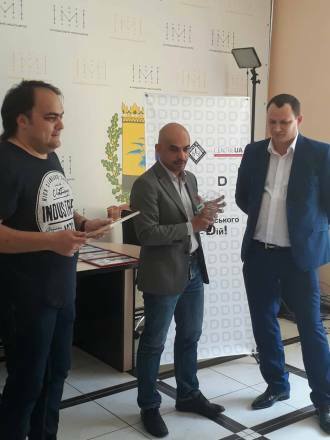 The organizer of the contest Andrei Romanenko and People’s Deputy of Ukraine Mustafa Nayem presented to the representatives of PJSC “EMSS” the deserved award for observance of the right to access to the public information by a private enterprise. This award Energomashspetsstal received for timely responses to requests for access to public information and the declarations provision of deputies of the Kramatorsk City Council who work at the enterprise. The selection of the best organizations of the city was carried out in four nominations: “The Most Open Public Utility Company of Kramatorsk”, “For the Observance of the Right to Access to Public Information by a Private Enterprise”, “The Most Open and Hospitable Municipal Institution”, “For an initiative that promotes openness, transparency and availability of government authorities”.